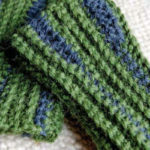 This item is first part of the third installment of “Sweaters That Fit & Flatter (Fitting Made Easy)”, from the series featured in Love of Knitting throughout 2017. 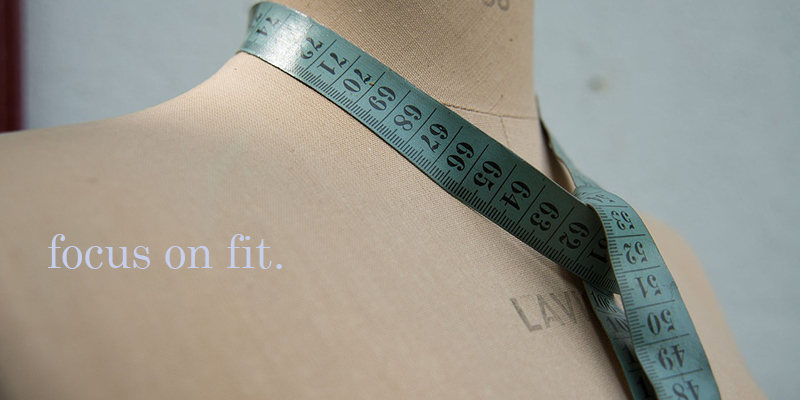 We’ve been warming up this series about fit for several weeks now, and at last we can start fitting! Laura has walked you through the basics in recent posts on taking measurements and understanding project schematics. Now it’s time to choose or modify a sweater pattern so that it flatters your body type.This week, I’ll explore hourglass, rectangle, and oval body types; Laura will return next week with modifications for triangle and inverted triangle shapes. Let me start with a story that might sound familiar to you. I first started paying attention to fashion in 1981. That was a dark time for clothing in general—we were just coming out of seventies styles—but for sweaters, it was positively abysmal. The only readymade sweaters available looked dreadful on me: oversized pullovers (big to match our hair) or the “classic” crewneck style with waistband ribbing but no other shaping. Neither garment silhouette worked for my petite hourglass figure, though for different reasons. The oversized sweaters were too big around and too long, making me look shorter and wider than I was; the more fitted crewnecks didn’t work because the ribbing sat just below my natural waist and bloused away from my belly. In short, these styles covered up my best assets instead of enhancing them. Left: Rachel is a petitie hourglass. Right: Deb is a petite rectangle. Fortunately, knitting entered my life in 1986. Because knitters don’t have to settle for readymade sweaters, I could choose my own garment silhouettes. Soon I learned some visual tricks to create the illusion of long vertical lines. These are knitting superpowers. Remember the guidelines I covered in the first Focus on Fit post: you can play with silhouette, fabric drape, and ease, no matter your body type. Manipulate all these elements to create the longest possible unbroken line down the body. Aim for garments that skim your underlying figure without clinging to or completely hiding it. 1. Add horizontal elements to widen a body part. 2. Add vertical elements to narrow a body part. 3. Use one color or texture to lengthen a body part. 4. Use multiple colors or textures to shorten a body part. How do these rules play out for different body types? Hourglasses have the easiest time creating balance, because they come closest to the ideal feminine shape drawn by fashion illustrators. * If you’re an hourglass, rectangle, or oval, by definition you’ve got visual balance between your shoulderline and hipline. Sweaters with vertical elements such as deep necklines or cable panels probably won’t throw off that balance, unless the cables stop and start as they travel up the torso. Horizontal elements can throw off balance, but it’s easy to rebalance: if the garment has a wide neckline, for example, add an eye-catching detail at the hemline or long sleeves with turned-up cuffs. Hourglasses should play up their clearly defined waists with designs that fit fairly close to the body or include some waist shaping. (Not a lot—when a waist gets too tight, the wearer can look and feel like an overstuffed sausage). 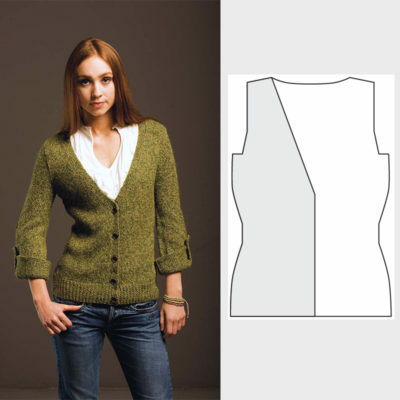 If you’re an hourglass who’s dying to knit an oversized sweater, be aware that lots of positive ease will add bulk and camouflage the narrowest part of the body; in short, positive ease at the waistline turns hourglass figures into rectangles. Even a small amount of waist shaping can preserve the comfort of a big sweater while adding a slimming line or two. 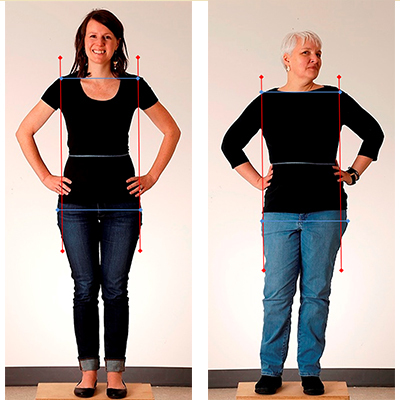 This rule about waist shaping also applies to rectangle and oval body types: visually create a defined waist. Belts, waist shaping, vertical darts, ribbing, cables, or diagonal elements near the waistline can all do the trick. Empire waists and A-line sweaters can also work if they don’t create too much positive ease at the waist. Jennifer Wood’s Idril sweater has an empire waist and waist shaping; it’s perfect for hourglasses and rectangles as is, and ovals could reduce or eliminate the waist shaping. Since I’m a height-challenged rectangle on my way to becoming a short oval (in other words, a circle), I generally want to create a waist in ways that don’t emphasize my tummy. I’ve had great luck employing vertical darts only on the back of a garment, drawing attention to the curves of my back without emphasizing the bowl full of jelly on my front. For instance, this cardigan features full-length cable panels on the fronts that skim my body. On the back, however, the cables stop at the waist, automatically pulling in the fabric. Weirdly, horizontal elements can also help define the waist. While horizontal elements add width (Rule 1), they also break up or extend vertical lines (Rules 3 and 4), so play with these seemingly contradictory ideas. Horizontal lines of color at the waistline will automatically define that region, especially when they coexist with other visual tricks. 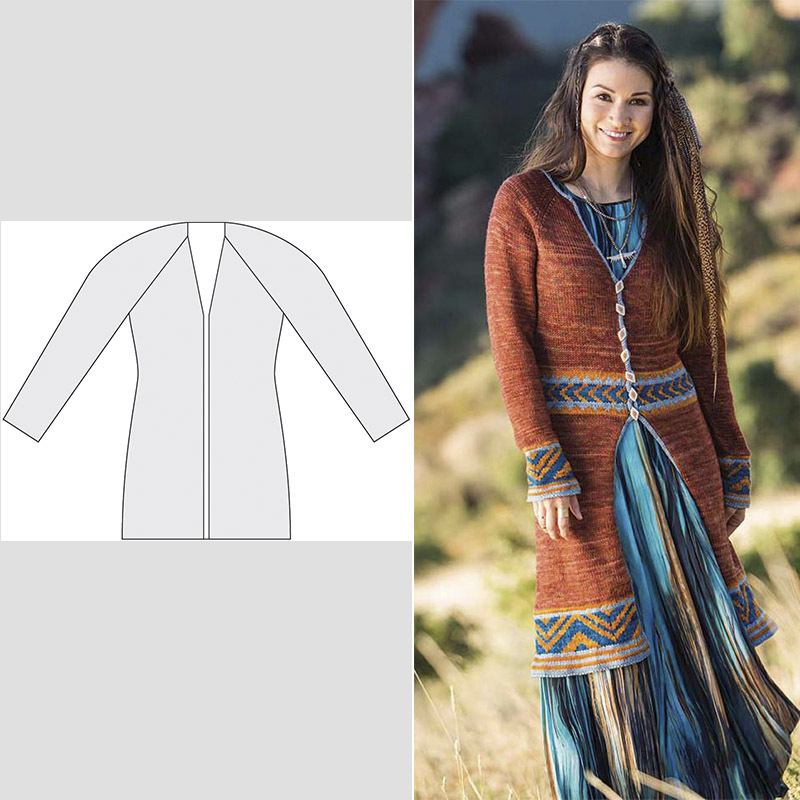 For instance, Anne Podlesak’s Grand Canyon Coat combines waist shaping with a colorwork band at the waist, where the line of buttons ends. Above and below the buttons, the V-neck and flaring front bands add diagonal lines that point directly to the waist. Another great example, Amy Miller’s Gradient Pullover from knit.wear Spring 2013, features minimal waist shaping—the sweater narrows down from the bust but doesn’t flare out again for the hips—and creates horizontal lines with color blocks. Both of these striking sweaters would flatter hourglass and rectangle body types. I would probably size them with one to two inches of positive ease at the waist so the fabric hangs more loosely over my tummy. Sleeve length offers another opportunity to emphasize or camouflage parts of the body. In Knit to Flatter, Amy Herzog explains how sleeve length affects visual balance: long sleeves draw attention to the legs; three-quarter sleeves emphasize the hips; elbow-length sleeves highlight the waistline; short sleeves accentuate the bust. If I made the Gradient Pullover, I’d shorten the sleeves to the elbow, thus adding another horizontal element that helps define my waist. Or better still, I’d align the colorblock line on the sleeves and body, shortening the sleeves to three-quarter-length. As designed, the sweater’s darkest color begins lower down on the sleeves than on the body, and that deliberate misalignment would draw unwanted focus to my tummy region. You can see the same effect on a boxy cropped top with full-length sleeves. If you’re a rectangle or hourglass who loves cropped tops, try shortening the sleeves so that they’re the same length as the sweater body or not much longer. Finally, garment length lets you play with visual balance in relation to your total height. Hemlines naturally create a horizontal element on a knitted garment and (unless you’re wearing a floor-length knitted dress) cut your height into smaller vertical lines, as in Rule 4 above. Hemlines also widen parts of the body; hourglasses and rectangles might want to avoid sweaters that stop at their hiplines, since a wider hipline could throw off visual balance. Think about vertical proportions as you explore sweater length. If you’re petite, longer garments will make your legs look shorter—which is great if your legs are long compared to your torso, but not so wonderful otherwise. Rachel, at 5’3″, has already decided to shorten the 28″ long Killarney Tunic for this very reason. Laura, who’s 5’7″, can carry off a tunic-length sweater without shortening it. But I don’t see any way to make this garment work for me, since it’s too long and too big around. (I’m about the same height as Rachel, but my legs are shorter in relation to my torso.) If I simply had to have Killarney, making it fit would basically require butchering a lovely design. When you want to Frankenstein a pattern, work smart: if you like, say, the cowl neckline or the asymmetrical hems on Killarney, add these features to a pattern that already fits you in the body. That’s much easier than reworking the entire sweater body. 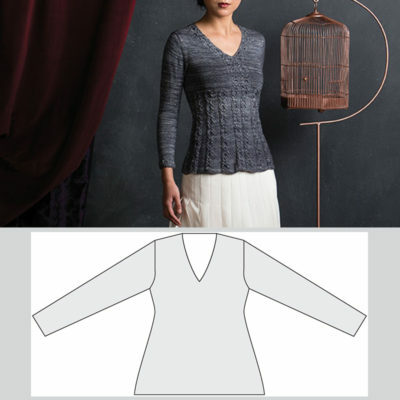 Killarney Tunic by Sarah Solomon on a petite hourglass, petite rectangle, and average-height triangle. Second, pattern schematics show the garment’s overall silhouette as well as finished measurements. I was drawn to Jennifer Dassau’s Broken Lines Pullover from the photos: its contrast stripes introduce both visual and horizontal elements. But the schematics told me even more. There’s a small amount of waist shaping, but there’s still plenty of fabric to drape over the tummy. Best of all, the angled hem will add some length to my legs (hey, I can dream). Shaped hemlines look great on petites, especially short-legged ones. This design flatters my rectanglish-oval body type as written. If I made any modifications at all, I might reduce the vertical distance between stripes so I could shorten the whole garment by an inch or two, then shorten the sleeves to match. So to recap, we’ve explored a number of fit considerations for hourglasses, rectangles, and ovals that can add to your knitting superpowers. Maintain balance between shoulderline and hipline. Define a waistline. Work with sleeve length and overall garment length. You’re the knitter; you’ve got the power. Just remember to use your knitting superpowers for good and not for evil. *Tall hourglasses really have an advantage. In life drawing classes, art students learn to draw standing humans as 8 heads tall (that is, multiply the “height” of the skull by 8 to get the total height). Fashion illustrators, however, draw their stock figures 9 heads tall. Most women would need a fun-house mirror to achieve the same effect. Amy Herzog, Knit Wear Love (Stewart, Tabori & Chang, 2015). Amy Herzog, Knit to Flatter (Stewart, Tabori & Chang, 2013).